I’d not been to Norway until earlier this year. I’ve travelled across the world from New Zealand to East Africa, Cuba, the US and beyond but never East across to our North Sea neighbours. Once I was there, the obvious question was why’d it taken so long? I think, deep down, I was saving it. Like opening the best present last. It’s magical, naturally glistening with grounded forward thinking people. Creatively, it’s a bubbling pool, reflecting a culture closely tied to land, the environment and crucially, democracy and fairness. When it comes to the environment of course there’s no over-looking one thing. It’s a society fueled, quite literally by the oil and gas industry. But that party is coming to an end. It’s financed great education, healthcare and created a brilliantly balanced society, somewhat ironically perhaps, allowing a good quality of life and enjoyment of nature. Norway is a country divesting from fossil fuel. It’s North Sea operations are slowly winding down with much of the west coast threatened with high unemployment levels and seeking economic diversification. It’s at a clear point of transition. I was curious to know how the country was reflecting its connection to nature, culturally and in particular through art. Thankfully, I was not disappointed. I left more inspired and motivated than ever. It’s a conscious country, distinctly in tune with nature on a number of levels. Perhaps not overtly at a political level, but between the cracks the ebb and flow of society shows a people placing value on creativity, nature, regeneration, architecture and public space. Here’s an overview of my top finds. This is Norwegian artist Anna-Eva Bergman (1909-1987) in Northern Norway in 1953. To me, she represents the enchantment at the heart of Norway’s cultural connection to nature. I stumbled across a retrospective of her work ‘Grafisk Univers’ at the National Museum in Oslo. It was one of the most inspiring, peaceful and uplifting exhibitions I’ve seen. 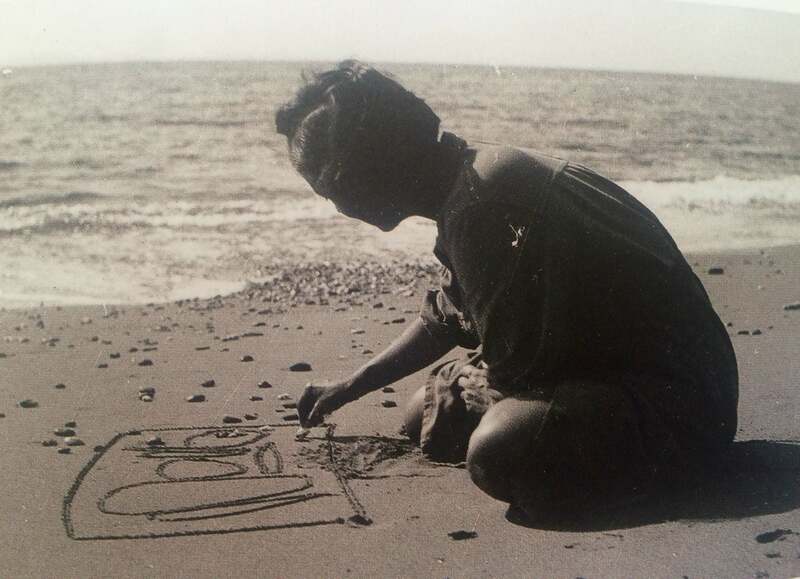 I’d not heard of Anna-Eva Bergman before my trip to Oslo, but she had a clear connection to the world around her, her simple geometric and natural forms deeply poetic and spiritual. Despite spending most of her life in France, Norway was central to her work. Impressions from two journeys to Northern Norway in the summers of 1950 and 1964 had a lasting influence on her prints and paintings. She became fascinated by Artic light and Norwegian nature; the country’s deep fjords, steep mountains, vast ocean waters, midnight sun and endless horizons. 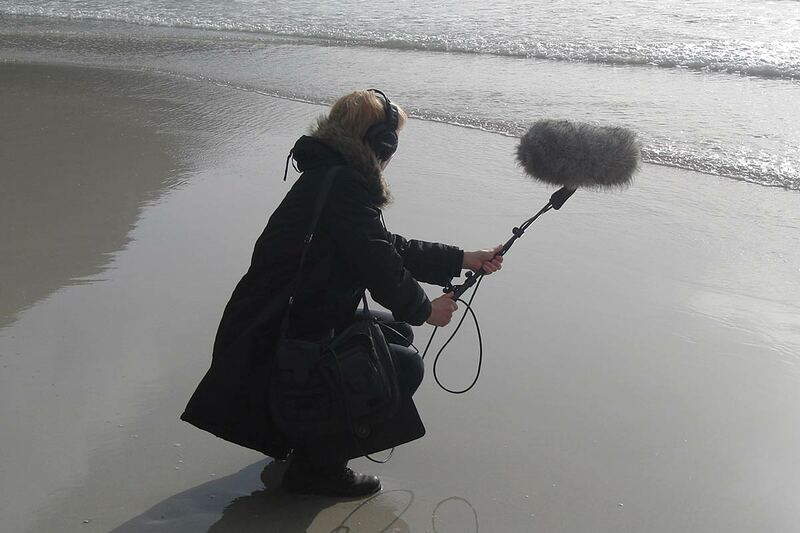 Sounds like Nordland (Lyder som Nordland) began in 2012 as a collaboration between the two Norwegian sound artists Siri Austeen and Elin Øyen Vister . Sounds like Nordland creates a new and inspiring platform telling stories of Nordland and of how our contemporary society lives together with nature. Based on a public collection of sounds from the region, hear recordings of Orca whales off the coast to native birds and sounds of domestic human life. 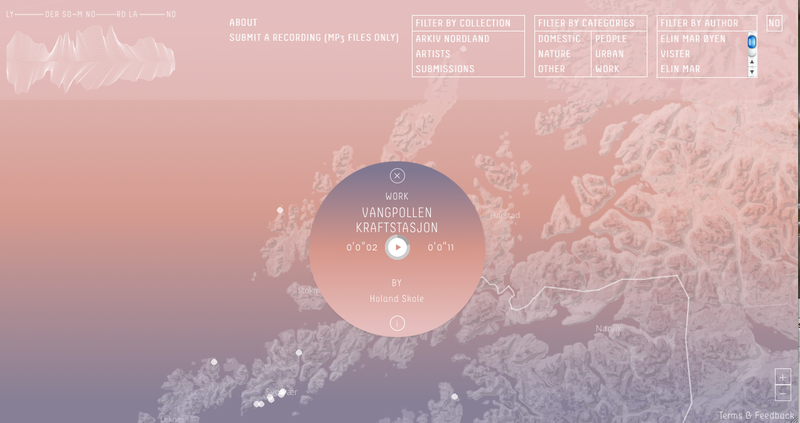 The project, in collaboration with Arkiv I Nordland, aims to promote the significance of sound as a contemporary document, as well as investigate Nordland region as an acoustic landscape. It’s a powerful new way to distill who we are and the rich variety of life we navigate. Stuart Ian Frost is an internationally acclaimed sculptor and environmental artist based in Norway, North West of Oslo. His work has the wow factor. There’s no other way of putting it. Born in Britain in 1960, Stuart has decades of experience working with natural materials. When it comes to ‘land art’, he’s definitely up there with the greats. 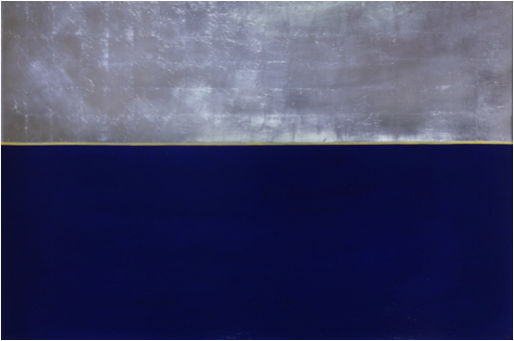 With the notion of ‘place’ central to his work, his artwork can be found across the world from Peru to Mexico, Finland, Portugal and beyond. 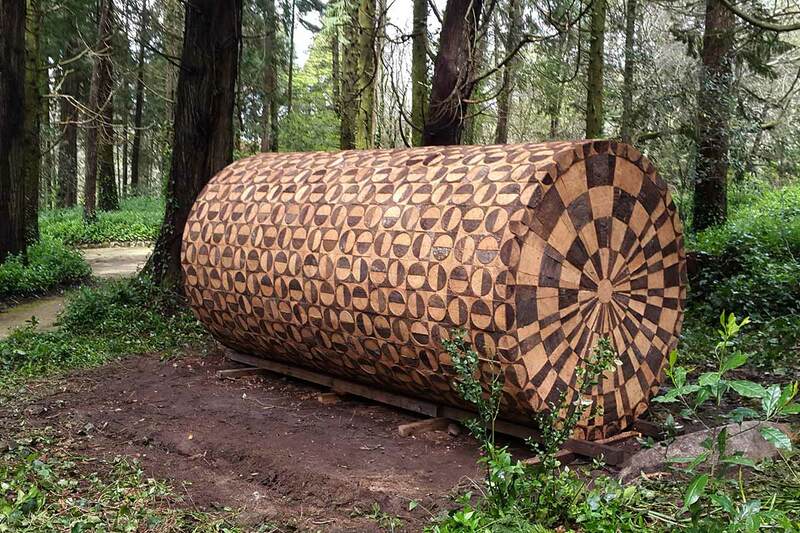 His latest work, made from cork, can be seen in Sintra´s Parque da Pena in Lisbon, Portugal, a UNESCO World Heritage Site, from May 25th 2016. “Point of View” explores the dialogue between Man and Nature with unique, site specific, contemporary art commemorating the 200th anniversary of King Ferdinand II, the visionary behind and founder of the Park of Pena. Throughout Stuart’s artistic career, he has sought out specific places in various countries and carried out so-called site-specific projects. He searches for characteristics and qualities of each place, such as history, topography, architecture, culture, and specifically raw material. He is interested in particularities of landscapes, the physical characteristic of natural objects and exclusiveness to one environment. Their culture, myths, and history are a common feature in his production. 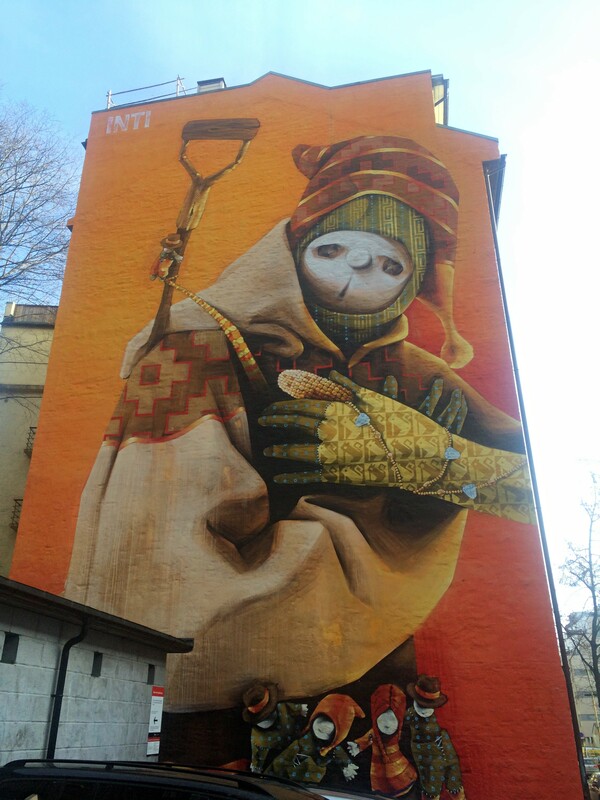 Mural by Chilean street artist Inti in Toyen, Oslo. Viktor casually mentions his grassroots activism and role in the Green Party as he strolls around Toyen in Oslo. He’s taking me on a tour of the street art he’s helped to create over the past decade in this part of his home town. “We’re lucky in some regard to have so many gable ends, it’s as a result of the housing crash here many decades ago. Buildings just stopped being built. So, now we have street art instead” says Viktor. This is a man who gets things done. His passion for art has led to a gradual build up of large murals in Oslo, inviting international street artists to improve the local area wall by wall each year. This is not from a big, financed street art festival, purely a great example of the local community working to improve the urban environment for all. If there’s anything that epitomises why I love Norway, and indeed it’s shining role in the art world, it’s Nuart. Founded by Martyn Reed, Nuart is an international contemporary street and urban art festival, held annually in Stavanger on the West coast of Norway since 2001. It is widely considered the world’s leading celebration of Street Art. The event aims to stimulate debate by challenging entrenched notions of what art is, and more importantly, what it can be. Nuart aims to provide an internationally relevant, challenging and dynamic environment for artists, students, gallery goers and public alike; an event that aims to reflect the culture as well as participate it helping define it. 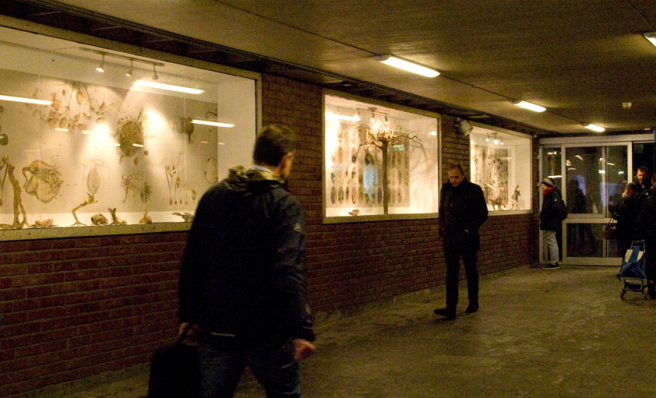 For me, art is about play, experience, experiments, as well as improving spaces and lives. This lies at the heart of Nuart’s philosophy. Simply, the world needs more of what they’re up to. ‘What have we done to that love?’ A 2016 CAN expo. at Toyen station. Impressed with their ambition, I met with CAN’s Elizabeth Medboe and Siri Austeen in Oslo and will certainly watch their progress with interest. 7. RESEARCH: Climart: Norwegian University of Science and Technology (NTNU), Trondheim, Norway. This question lies at the core of a four year multidisciplinary research project run by a team of international researchers in psychology, natural science and the arts. Launched in 2014, the research includes studies assessing how audiences are affected by climate-related artwork and the engagement of a visual art for this project itself. The initiative is led by Christian A. Klöckner Professor in Social Psychology at the Institute of Psychology at NTNU. 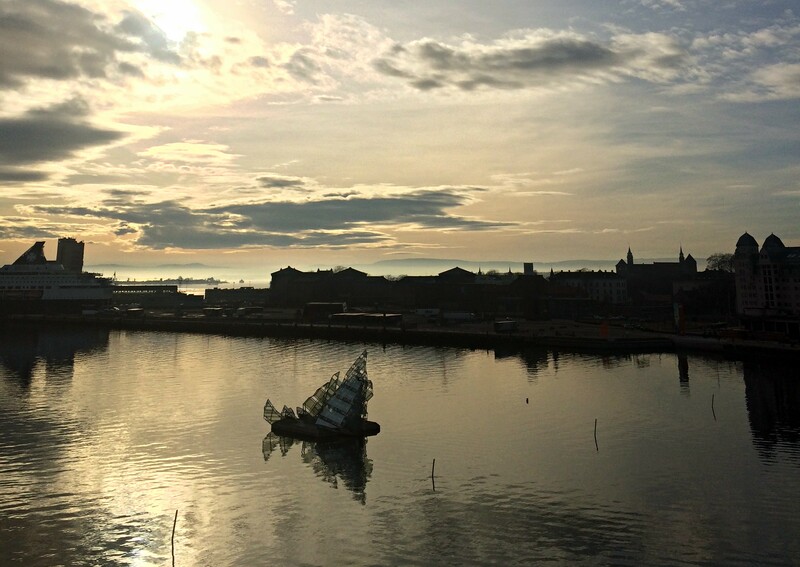 It will culminate in a public artwork in Oslo. The team hopes that the data they collect will inform the fields of environmental psychology, visual art and communication around sustainability and climate. I very much hope so too, the more world’s that merge around the issue, and fast, the better. Finally, architecture. It’s not often one is blown away by a building. But in, 2007 Mortensrud Church was designated one of the most important post-war buildings in Norway. It’s easy to see why. I want to end on it because it’s feels like a small beacon of hope. Showing just what we can achieve if we truly think about how to live together with the natural environment. 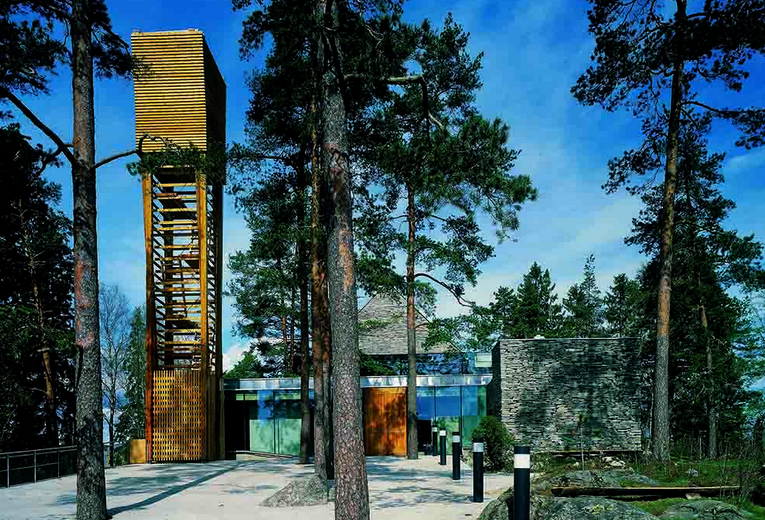 The Church stands on the crest of a hill in a dense pine forest outside Oslo. Built is 2002, nature is gracefully integrated into the building weaving and reflecting amongst sensitively designed slate, glass and steel. Rather than clearing the foundations for the site of all the sharp rocks and all unevenness, the concept focused on consistently incorporating these natural elements into the structure. Various rock formations simply protrude through the terrazzo floor. And some of the trees have likewise been preserved, integrated into light-filled atriums inside the building. Through the interstices between the stones, light falls into the interior. Together with the color of the slate, which changes as daylight progresses; this serves to create a religious atmosphere despite the quite manifest technical nature of the building’s structure. And rather brilliantly, it’s all about the detail here. Hidden in Gunnar Torvund’s altarpiece are three special stones; one from the Berlin Wall, one from Robben Island (where Mandela was imprisoned) and one from Jerusalem. It’s a building that leaves you wanting more, filled with inspiration and ideas for the possibilities of how we can live and interact with our environment. Actually, more than that, it’s a pure celebration of the life around us. Thank you to PML Arkitektur for helping me discover a very special place.